In this post, I will show you how to use the ARAP Path app for generating a path between two protein structures. Let us start with a list of requirements, then a tutorial on how to use the app. Before starting the tutorial, I would like to ask you to download this file (ArapInterpolation) which contains necessary files for this tutorial. After extracting it, you will have two pdb files: 1ddt_A.pdb and 1mdt_A.pdb. Our goal is to use the ARAP Path app to generate a path from 1ddt_A.pdb to 1mdt_A.pdb. These are two conformations from chain As of the pdb entries 1DDT and 1MDT in the Protein Data Bank, respectively, for Diphtheria Toxin. Run SAMSON 0.7.0. Load 1ddt_A.pdb and 1mdt_A.pdb. In the Document View, right click on the structural model of 1DDT_A.pdb, select Store Conformation, name the new conformation as 1ddtA. Do it similarly for the structural model of 1MDT_A.pdb, name the conformation as 1mdtA. See the animation below. Open the Arap Path app by clicking on its picture or you can find its name under App on the toolbar. Make sure you set the lock at the right corner in the app window to closed position (see the figure below) so that the app’s window always stays in the foreground. In the app, click Get all conformations to get all the conformations in the Document view. Then, in the Start and Goal lists, select 1ddtA and 1mdtA, respectively. All atoms: consider all the atoms for matching. All except hydrogens: consider all the atoms except hydrogens for matching. Only Alpha Carbons: consider only alpha carbon atoms for matching. Only Backbone: consider only backbone atoms for matching. from bonds in the Start structure: create ARAP edges based on the covalent bonds in the start structure. from consecutive CA-CA: create ARAP edges between alpha carbons in consecutive residues of the start structure. from hydrogen bonds with cutoff distance: create ARAP edges for hydrogen bonds whose lengths are shorter than the cutoff distance in the start structure. atom pairs whose distances are within a range: create ARAP edges for atom pairs whose distances are within the specified range in the start structure. CA pairs whose distances are within a range: create ARAP edges for alpha-carbon atom pairs whose distances are within the specified range in the start structure. Try connecting CA and CA before and after missing residue segments: create ARAP edges for the alpha carbon atoms before and after each segment of missing residues in the start structure. Check the box of Perform alignment before interpolation. This will align the start conformation onto the goal conformation before performing ARAP interpolation. Set “Number of path conformations” to 20 to generate a path of 20 conformations (note that the start and goal conformations are also included in the path). At the end, you should have the settings as shown in the below figure. After the interpolation, the information of the run will be summarized in the box at the bottom of the app (the text area marked with Other information… in the last figure). A new visual model (named ARAP edges in the Document View) is also created for showing the ARAP edges. In this visual model, the colors of the edges have the same colors as the squares that are beside the checkboxes of ARAP edge construction types in the app window. For clearly visualizing the ARAP edges, you can hide the stick-and-ball representation of 1DDT_A.pdb and 1MDT_A.pdb in the Document View by unchecking the boxes next to them. Let us now create a secondary structure so that we can visualize more easily the protein structure. Right-click on 1DDT_A.pdb in the Document View, select Add>Visual Model. In the Add visual model window just showing up, set the name of the new visual model to 1ddtA, and the visual model type to Secondary structure. Click Ok, you will see a ribbon (or cartoon) representation of the structure of 1DDT_A.pdb. Now, hide the visual model for edge construction types by unchecking the box next to the visual model ARAP edges in the Document View. 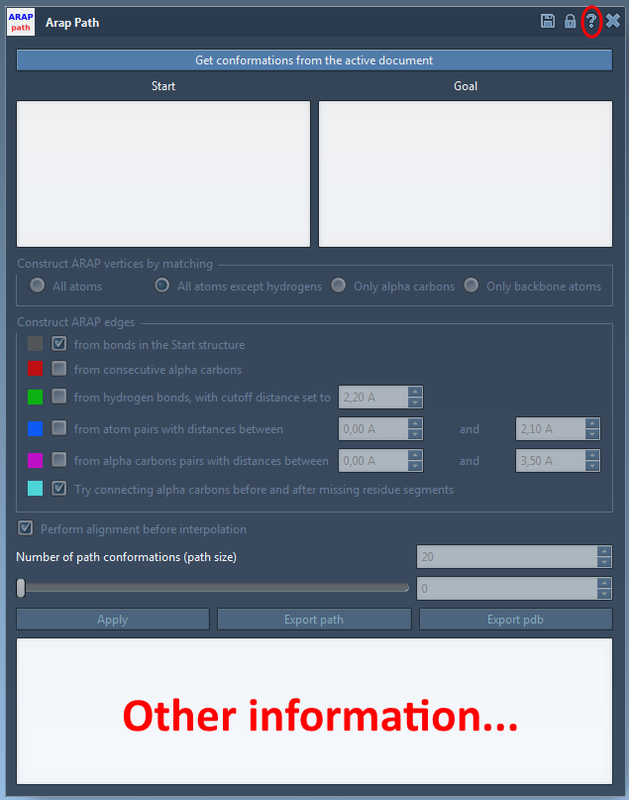 In the Arap Path app, manipulate the slider or the number in the box next to it for viewing the conformations along the path (see the animation below). For exporting as SAMSON path, click Export path button, a path node with the name “Path” is created in the Document View. For exporting as PDB files, click Export pdb, then select a folder you want to export them to. Each conformation will be saved as a pdb file with a sequence id at the end of the file name. In addition, a pml file is also created for viewing the path with Pymol.